One of The Observer's best children's books of 2018! Move over, Bonnie and Clyde, because there's a new criminal mastermind in town ... Baby Frank! Baby Frank's parents say that he can't have a pet - `Pets are for older kids', `Be happy with your teddy', `They cost too much to keep' - which leaves Baby Frank with a BIG problem because he REALLY wants a pet. What's a baby to do ... ? Rob a bank, of course! But will money buy Baby Frank the fluffy pet he so desperately wants? 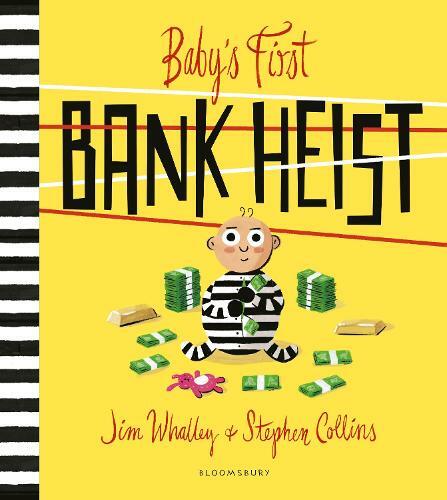 This is a major new partnership - Stephen Collins, cartoonist in Guardian Weekend magazine, and Jim Whalley, an exciting debut author. It's Burglar Bill for a whole new generation and is perfect for fans of Chris Haughton, Rob Biddulph and Jon Klassen. A lovely story about cheeky baby Frank. It flows along so beautifully. The rhyming is fun and enables children to join in.